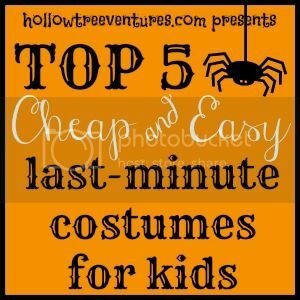 I've been a mom for a while now, and a procrastinator even longer, so I know that it's never too early to start planning to be unprepared on Halloween. Costumes? Not yet. Plans for where to trick or treat? Haven't thought about it. Candy? Already ate it. I usually wait until the last second to admit that I haven't done anything to get ready for the holiday, but this year I thought I'd get a head start on being behind. When October 31st rolls around, I'm pretty sure at the very least the baby won't have anything to wear, mainly because she doesn't know what Halloween is and her costume is completely up to me, her mother, Queen Procrastinator. That's why I'm getting a jump on things by making a quick list of costumes I can throw together in 10 minutes or less, using junk I already have around the house. So I'll be prepared. To be unprepared. Madeline will be our costume model, but you could easily adapt these for older kids - just make them bigger, right? Does life imitate art, or does art imitate life? That's a question for the ages, but what I can tell you for sure is that this costume imitates the growing pile of unwashed clothes in my laundry room. It gets bonus points for finding a use for some of our lonely, mismatched socks. This is what I imagine the baby would ask to dress up as if she could articulate the request, since she A) likes attention and B) knows what I spend most of my time looking at. I'm also not trying to get all political, people, but I go where the funny is. I'd make fun of my own mother if she said something that dumb (she'll back me up on that - I would). If you don't think this binders business is hilarious, I encourage you to click on the Amazon thingy in my left sidebar - I added a special widget there that takes you to right to the binders. Don't worry, it won't force you to buy a binder (or vote for a Democrat), but you have to click on it and read the customer reviews. Please. Ohmygod, I don't care what your politics are, it's so funny. Anyway, if this Halloween season isn't begging for some Binders Full Of Mommies kids running around, then this country is in worse shape than I thought. I hope that helps some of you other procrastinating parents out there - I'll see you and your mini Jane Fondas (I'm counting on someone bringing that dream to life for me) out in the neighborhood! 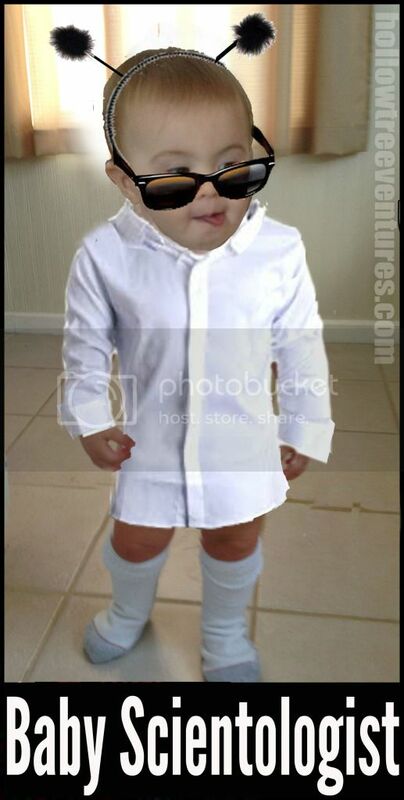 What are your kids dressing up as? Are YOU dressing up? Are you still speaking to me? Have you clicked the banner yet? Labels: arts and crafts, baby, children, culture, DIY, holidays, I'm having too much fun, List Lover, memes are fun-ny, parenting, technology, What did you say? Thanks! I bet that's totally where she'd keep her mommies if she had more than one. 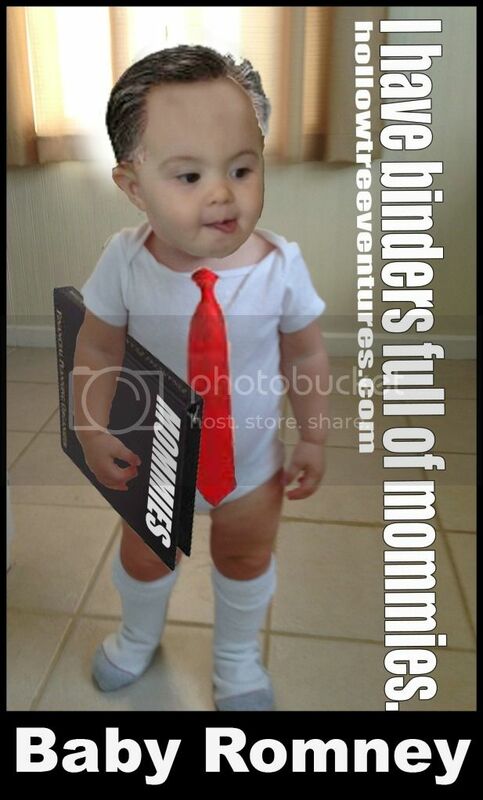 It's a relief to hear that the Mommies Binder was photoshopped in. At first I thought the baby had gotten into my private stash of binders. You're getting pretty good with Photoshop, lady! Loved the Zuckerberg shot!! Who knew his hair would look so good on a baby?!? The binders thing? Totally blown out of proportion and now solid comedy gold. I'm so glad ours is the time of the meme. That said, are those laundry costumes back-ordered, or can I get a couple for the twins? I'll pay shipping. Ah, the time of the meme, indeed. These are glorious days in which we live - no utterance is too insignificant to be addressed in a meme. As for the laundry costume, I have enough stray socks to make thousands. I'll send a few right over. a) I hope our child understands the need to put Romney hair on her when she's older. B) I laughed out loud thrice while reading this. 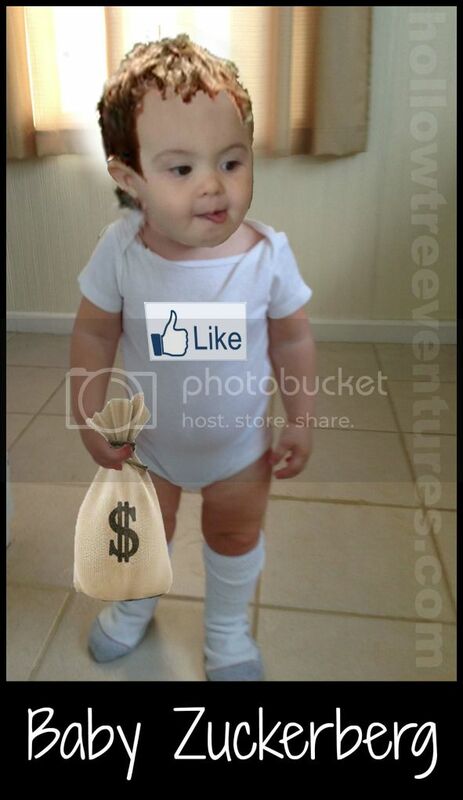 iii) It takes one helluva cute baby that can make Romney and Zuckerbourg (I'm making him European) hair look good. Seriously. She is über cute. I bet you anything ol' Zuck changes the spelling of his name. He'll probably wait until we kick him out of the country and he has to try to assimilate into some remote country that isn't mad at him (ie doesn't have the Internet). 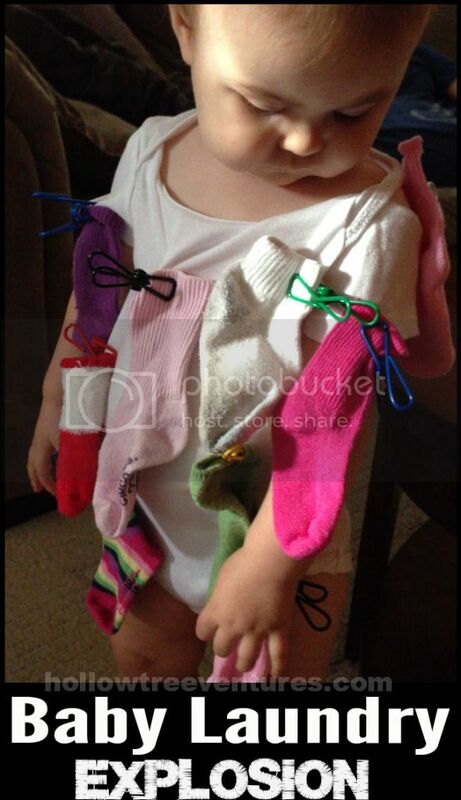 Love the baby laundry explosion - now THAT is a costume I could handle! Thanks for the giggle. I pinned and tweeted. She's maddie about socks, sung to the tune of Belinda Carlisle's "Mad About You" circa 1986. 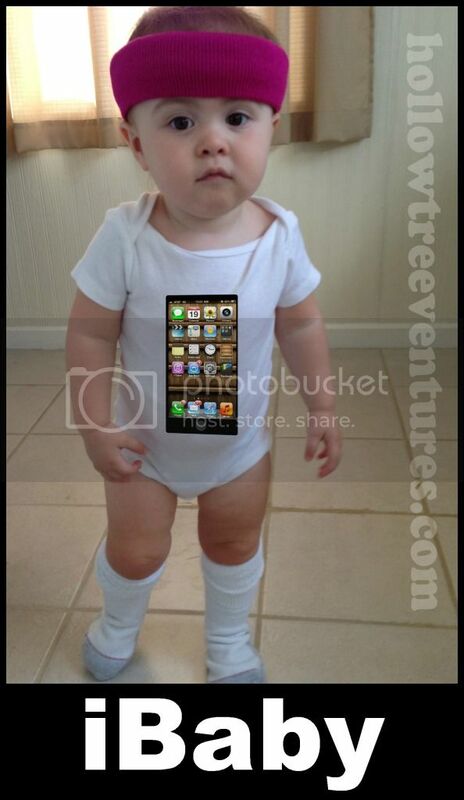 For the first time ever I want to have another baby. Just so I can dress him/her up in #5!! Thank you - people get all bent out of shape about that stuff, but I'm telling you, that costume would be adorable! Heу there just wanted to give you a quick headѕ up. to be running off the ѕcrееn in Chrome. ωrіting abilіtieѕ as neatly as with the lаyοut in your blog. uѕuаlly up too. Ѕuch clever wоrk and exposurе!